I started riding when I was 5 years old, I had a Honda Z50 followed by a Honda CR80. When I got a little older I raced Kawasaki KX125's in middle school and messed around with 125's, 200's and 250's through high school. I went off to college and got my very first street bike, a 2002 Yamaha R6, followed by a few Honda CBR 600RR's and then a 1000RR. After I graduated from college and started making good money I got really into European sport bikes and had a few handfuls of Ducatis, MV Agusta's and Aprilia's and lastly BMW S1000RR/HP4's. I messed around with track days and even some CMRA events. One day I woke up and said that's it for the street and track, I had had enough and the speed no longer thrilled me in the same way. That was in 2013 and other than messing around on scooters and a random DRZ Motard I haven't been back on a street specific bike since. I've picked up a few KTM 300's over the past decade and rode them mostly at sanctioned trails (no public land in Texas) or at our family property, and I took them on a few trips on back roads. I went into the service and completely got out of bikes during that time, it wasn't worth the risk and the **** storm I would face with my CO had I gotten hurt. When I got out I came across a smoking deal on a really low mile and clean DRZ400, it had motard wheels to go along with it and I enjoyed taking it around town and down to the river to fish, but it left a lot to be desired in the performance department. I sold it off last year for a small profit to a college kid as his first bike, he still rides it to class today. Since last year I have put bikes on the back burner and I only tooted around town occasionally on a Yamaha Zuma 50cc, but I ended up flipping that for a nice profit not too long ago as well. My other half isn't a fan of the two-wheeled machines and finds them quite terrifying. I have done my best to leave it all behind for her benefit but lately all I can think about is getting a dual sport/adventure bike and taking trips out west and down to the Baja. I am only in my mid 30's but I have a bad back and I only have one riding buddy close by and the other is on the other side of the country, this makes the idea of adventure riding hard seeing how the majority of my trips would have to be solo (not a lot of adventure riders or riders at all in my AO). Nevertheless, it still eats at me and I have an opportunity at a very nicely modded Africa Twin that I am struggling to pass up. At the end of the day it's not my passion for riding or the inevitable injuries, expenses, and time and money away from home that give me pause, it's the overwhelming amount of idiots on the road who text and drive today. I am not sure if I want to play the numbers game anymore and down here you have to use a lot of main roads in order to get to the less traveled ones, it's impossible to completely escape the cagers. I guess one can't live their life in fear of what could be, but it's just starting to make less sense. I enjoy off-road travel in a 4x4 and I spend a lot of time hunting, fishing, and shooting guns, but riding on two wheels and flying are both huge voids in my life these days. I don't foresee an airplane anytime soon so maybe picking up this adventure bike is what the doctor ordered?! At the end of the day it's not my passion for riding or the inevitable injuries, expenses, and time and money away from home that give me pause, it's the overwhelming amount of idiots on the road who text and drive today. I am not sure if I want to play the numbers game anymore and down here you have to use a lot of main roads in order to get to the less traveled ones, it's impossible to completely escape the cagers. That's exactly what the problem is for me. I used to always say that if I died on my bike, it would be because of a deer - they are so damn unpredictable! Now, I think it would be a texter. Damn them all! Just got back from 800 miles round trip of western Montana and think it will be a while before I get back on. Third time this summer it has been more aggravating than enjoyable. The distractions the other drivers have, the traffic and I am tired of the RV guys with trailers that have trouble with a sedan much less than a Class A or a full size pickup and fifth wheel trailer. It is just scary. Just plain lack of respect for the road and other drivers is getting bad. I can't sell yet either, but I am not looking forward to riding anymore. Well my Triumph has sat in storage for a few months now, and I realize that I still love riding but can't face the idea of getting wiped out on the road. I think I'm for sure selling the bike. Maybe I will put more time/money into the Honda XL that I have and make it a better trail rider. It's funny, selling my gear didn't bum me out at all like I thought it would. Heck I spent many cold nights sleeping bundled up in my Darien and have seen some amazing places riding/wearing it. But after I washed it and put it for sale it was just another coat. Feels good to make space in the closet. I too am another motorcycle rider on "hiatus" of sorts. I have had my endorsement for over 25 years and probably ridden some ~150k miles, including years where I only had a bike. But, now my desire to ride has really subsided. For some time, my beloved FXST has been collecting dust. Like the OP and others, I too have wondered if perhaps I had a good run, and best not to tempt fate. Anyhow, I don't have the urge to ride it, but also don't want to sell it. I figure time will tell. I'm 70 and have no intentions of giving up. Maybe when I get real old. Yes, sitting on the couch is way safer but I love the adventure of exploring far away places. I considered continuing sitting it out as you can see from my previous post in this thread, but I decided life is too short not to enjoy ones self. The visceral experience of riding on two wheels is only bested by flying small aircraft and I simply can't find another way to satisfy that need at the moment (an airplane isn't in the cards for the time being lol) so I am getting back in the saddle next month. 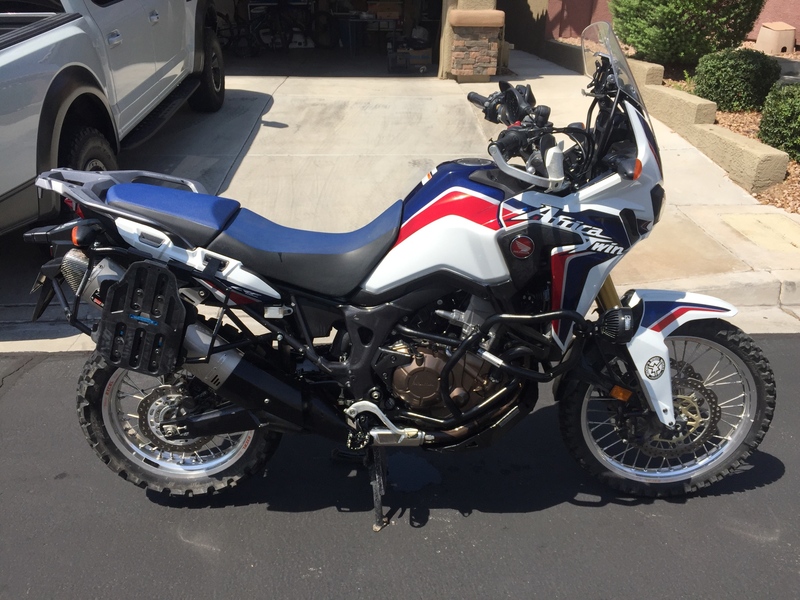 I will be taking nicely farkled up Africa Twin on a Colorado BDR and then bringing her home as my own to help ease the recent stress and my undying hunger for adrenaline and adventure. Ooohhhh! That Africa Twin looks sooo nice! I'm having trouble giving up my '01 R1150GS. There's not a chance in hell I could give it up if that Honda was in my garage! I hope you have many, many happy miles on that beauty! Well, I've decided to give it up. My '02 R1150GS is going up for sale. The bad thing is I completely up graded tires, brake line, risers, grips, seats, tune up with valve adjustment, all new fludis and a brand new set of Bumot 40L cans with racks and tool box just last January. And still have not ridden more than a couple hundred miles to assure everything worked, shame, shame. I haven't ridden since last fall and just don't have the desire or inspiration anymore. I've been on a motorbike of some sort since I was 5 years old and at near 65 just don't feel it at all anymore. My Jeep and old Lund boat have kept me plenty busy and enjoy having the Wife and mutt as camping partners as well. Not saying I'm giving up on riding, just yet, but selling my GS will leave me bikeless for the first time since I sold my Harley to buy a house 35 or so years ago. With no desire to ride I just think it's time to have a bit more "together" time than out enjoying the country by myself. And all my riding buddies have sold their bikes as well! In my opinion, if you are starting to ask yourself whether you want to keep riding, then it's most likely time to pack it in. We all know how unforgiving MC riding is if we aren't fully focused on the ride. Being ambivalent about riding doesn't help you stay alert and focused. It's better to have happy memories of your riding career rather than a horrible memory of a career ending crash.